If there’s one thing that modern keyboards and Macs are missing compared to old fashioned typewriters, it’s the loud typewriter sounds of yesteryear, because let’s face it, who doesn’t like an incredibly noisy keyboard? NoisyTyper is a hilarious Mac app that satisfies the need that nobody has, with different key and typing sounds for letters, spacebar, delete, scroll up and down, and even the classic ‘ding’ carriage return. 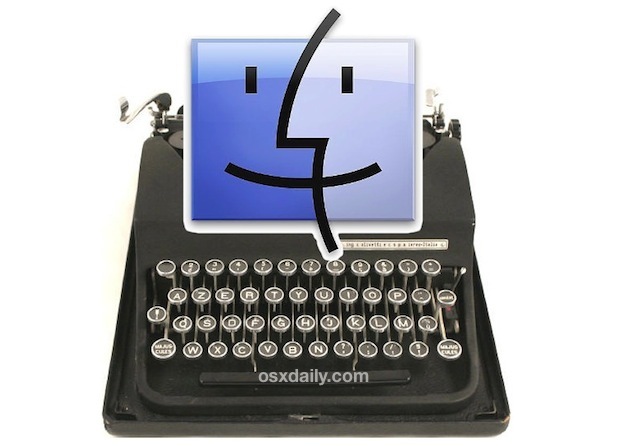 Once loaded, it works across all applications, guaranteeing those sounds from last century will follow you regardless of where you type on a Mac. You really have to watch the video embedded below to get an idea for just how noisy the app is, or download it yourself and find out the hard way. I think this app is hilarious and while it has a retro kick to it, it would also make for an excellent prank to play on unsuspecting colleagues and roommates. Because Noisy Typer runs in the background so you’ll have to quit it by typing “qaz123” or by finding it in Activity Monitor and killing the process. Just in case the app isn’t enough for you, there’s always the ridiculous full-on USB typewriter iMac conversion kit for the dedicated. LOL so useless but I love it, going to put this on everyones computer Monday morning. Only useful as a joke. I put in on my girlfriend’s laptop and it drove her insane. It was hilarious. Hey. How can i install it? How to launch it? Follow the instructions, just download it, enable assistive devices, launch the app. What computer is he using in the video? I can’t find a way to install it. I don’t see “Universal Access” in my preferences. if it does not quit go to Activity Monitor and make it quit ! on azerty, please write : aqw&é”, it will be faster than to launch the activity monitor ! is it just me or does this app make your mac use significantly more resources (and therefore hotter) ?? The only thing more perplexing to me then the fact that somebody would actually want to use this is that somebody actually took the time to make it. takes about +/- 1% of the cpu. but I do enjoy this while I’m typing! Seriously, this can be quite useful, e.g. me using headphones and wanting some keyboard feedback. Yeah, Keyclick is a great little utility. Has actual usable, customizable feedback sounds instead of novelty typewriter noises. How do I unzip this file on my MacAir? I’m running 10.9.3, and you have to enable it a little differently. The following was cut and pasted from another forum. Noisy Typer does work on Mavericks. All you have to do is go to System Preferences > Security & Privacy > Privacy > Accessibility and drag the app onto the list (you might have to click the lock in the bottom left corner to make changes). Then you can open the app and it should be there with the checkbox already ticked (if it’s not, try dragging the app onto the list while it’s running). I not did install on Mountain Lion (10.8.3). Do NOT download this! It infected my Mac and several months later, I still have not been able to get rid of it. The keyboard does weird things now and it attacks my computer at random. Pete, that’s a pretty serious charge. I’ve been using the app for a few days now and it works as advertised. Could you elaborate re. the problems? What do you mean by “infected”? and “attacks”? Wow. Have you tried to deinstall it? Remove it from Preferences, etc.? As an old touch typist I really like it. Learned to type in high school class. Might be the only class from HS that I still use productively to this day, and on a daily basis. Re. usefulness, I remember reading about a study they did years ago about typing on a computer keyboard with and without feedback sounds. They found that feedback sounds trick the brain, in turn tricking the fingers, that there is more “physical” key travel when typing with sounds. And THIS might be useful, at least to me, when considering getting and typing on a new 2015 Macbook. I tried one in an Apple Store and thought, there’s no way I could work, i.e. type on that keyboard all day. Not without the key travel and tactile feedback you get from a keyboard like the one on the 13″ Air, which I consider the best I’ve ever used.